Cangelosi » Roger Perron Inc. The confidence you have in your experience and knowledge of design turned out to be a project of complete satisfaction. 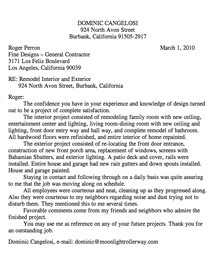 The interior project consisted of remodeling family room with new ceiling, entertainment center and lighting, living room-dining room with new ceiling and lighting, front door entry way and hall way, and complete remodel of bathroom. All hardwood floors were refinished, and entire interior of home repainted. The exterior project consisted of re-locating the front door entrance, construction of new front porch area, replacement of windows, screens with Bahamian Shutters, and exterior lighting. A patio deck and cover, rails were installed. Entire house and garage had new rain gutters and down spouts installed. House and garage painted. Staying in contact and following through on a daily basis was quite assuring to me that the job was moving along on schedule. All employees were courteous and neat, cleaning up as they progressed along. Also they were courteous to my neighbors regarding noise and dust trying not to disturb them. They mentioned this to me several times. Favorable comments come from my friends and neighbors who admire the finished project. You may use me as reference on any of your future projects. Thank you for an outstanding job.